A Wyoming Native from Torrington, WY, Dr. Knaub offers comprehensive, family-oriented, gentle dentistry. His objective is to make patients feel welcome and informed and leave with a better understanding of their oral health and treatment options, thus enabling them to make educated decisions. 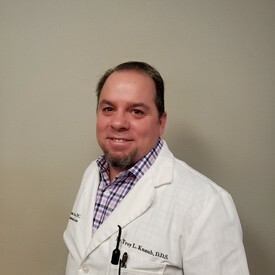 Dr. Knaub routinely participates in recognized continuing education courses in an effort to remain current on new treatment and upcoming advancements in technology. 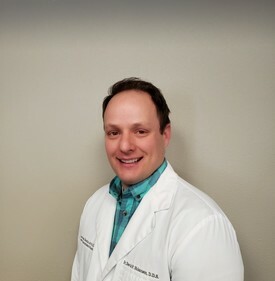 He has an incredibly compassionate, proficient, and personal team that continually strives to better themselves in an effort to always deliver the highest level of dental care. Dr. Knaub always welcomes new patients to his practice and attempts to accommodate emergencies as soon as possible. · Appointed by dental school course directors as teaching assistant: UndergraduateRemovable Prosthodontics and Fixed Prosthodontics. · American Academy of Dental Practice Administration and the American College of Prosthodontists Award. A Wyoming native, Dr. Dave Hokanson grew up in Star Valley, the youngest of five children. He graduated from the University of Wyoming in 2010 with a Bachelor of Science degree in Biology. He received his Doctor of Dental Surgery Degree (DDS) from Creighton University in Omaha, Nebraska. Dr. Hokanson and his wife Gina, also a graduate of the University of Wyoming, have five children, Hallie, Peyton, Jace, Taylee and Reese. Returning to Wyoming, and especially Laramie, is a dream come true for Dr. Hokanson as the community has everything he is looking for to raise his family. He enjoys building one to one relationships with patients and helping make positive changes in their lives. He understands that the dentist is not everyone’s favorite visit and as a result he takes measures to make it the most comfortable dental experience around. He has a warm, caring, and gentle style that helps ease the anxiety that can often be associated with dental care. A patient’s complete satisfaction is Dr. Hokanson’s primary concern. Dr. Hokanson is a member of the American Dental Association and the Wyoming Dental Association. He enjoys spending time with family, golfing, and just about anything outdoors. He is an avid University of Wyoming sports fan. Dr. Amber Welper is a Wyoming native. She was born and raised on a family owned ranch in southwest Wyoming. 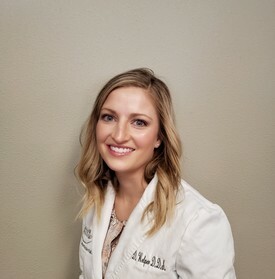 She studied Physiology at the University of Wyoming and received her Doctor of Dental Surgery Degree (DDS) from Creighton School of Dentistry in Omaha, Nebraska in 2015. Since then, she has been practicing in Lyman, Wyoming. Dr. Welper and her family have always loved Laramie and the University of Wyoming. She is excited to become a part of such a wonderful community and plans on cheering on the pokes every chance she gets! We are delighted to welcome Dr. Welper. She will begin accepting new patients January 2019!